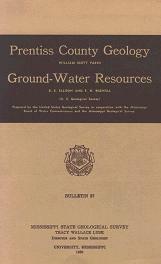 A study of the surface stratigraphy, structure, historical geology, and mineral resources. Minerals discussed include bentonite, clay, chalk, gravel, oil and gas. A part, prepared by the U. S. Geological Survey, deals with geologic formations and their water-bearing characteristics, and quality of water.